user certification required = Tool certification doesn't exist yet. if it breaks = Unplug machine, put a &quot;broken&quot; sign on machine, post on Talk. The drill press comes in a floor standing model. It has a motor driven head that has a chuck that accepts bits or cutters. It also has an adjustable table on which the work is mounted. It is operated by pulling a rotary lever that lowers the drill bit into the material. To avoid accidents, the following operational safety rules must be observed by everyone working on the Vancouver Hack Space drill press. Failure to follow the safety rules may result in a loss of shop privileges. A two foot perimeter around the drill press should be kept clear of people, debris and sawdust that impair traction or footing to avoid slips and falls. Safety glasses with side shields or a face shield must be worn. Hearing protection should be worn. Approach your work at VHS and on the drill press with a safe attitude! Make all drill press adjustments with the power shut off. Keep all guards and covers on the machine when it is on and running. Make sure the size of the bit is equal to or less than the capacity of the drill press. Drill into cylindrical stock using a “V” block. Long stock should be drilled with the excess to the left of the operator. If the stock rotates it will hit the drill press column, not the operator. Support the underside of the stock to be drilled with a backer board secured to the drill press table. DO NOT DRILL INTO THE DRILL PRESS’ TABLE, except for the existing hole in the centre of the drill press table! Never start the machine without the table clear of everything except the stock you are drilling. Keep hands and fingers at least 3” from rotating drill bits. When drilling deep holes, frequently raise the drill bit from the hole and use a chip brush to remove cuttings and allow the cool bit to cool down. If a drill bit binds, turn off the drill press and carefully turn drill chuck backwards by hand to free the drill bit. Never reach around or under a rotating drill bit or grab the chuck to stop a drill press. This can result in hand puncture or other serious injury. Turn the drill press off before looking up or walking away from the machine. Never stop the rotation of the drill chuck, spindle, or uncontrolled stock rotation when jammed on the bit with your hands or fingers. Don’t touch the drill bit and shavings since they are hot immediately after drilling. Always clean the drill press table and work area upon completion of the drilling task. Do not use your hands or blow the drill shavings, use a chip brush. When drilling into metal use cutting oil and apply moderate downward pressure. If you generate excessive smoke from the cutting oil you are either applying too much pressure or your bit is dull. Rags or chip brushes saturated with cutting oil should be disposed of in a fire can or outside in the dumpster. Never place oil saturated material in the interior garbage cans within the space! 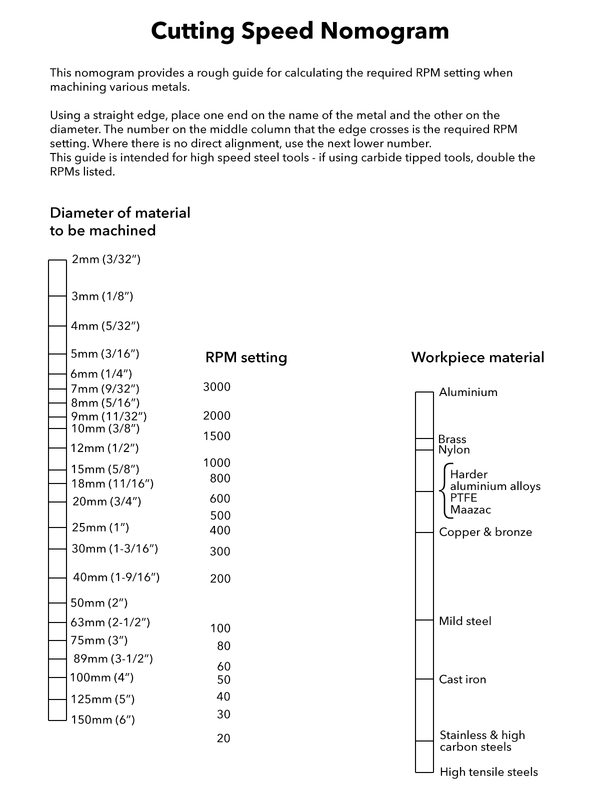 RPMs can be determined easily by using this cutting speed nomogram, just substitute the drill size for the workpiece diameter. 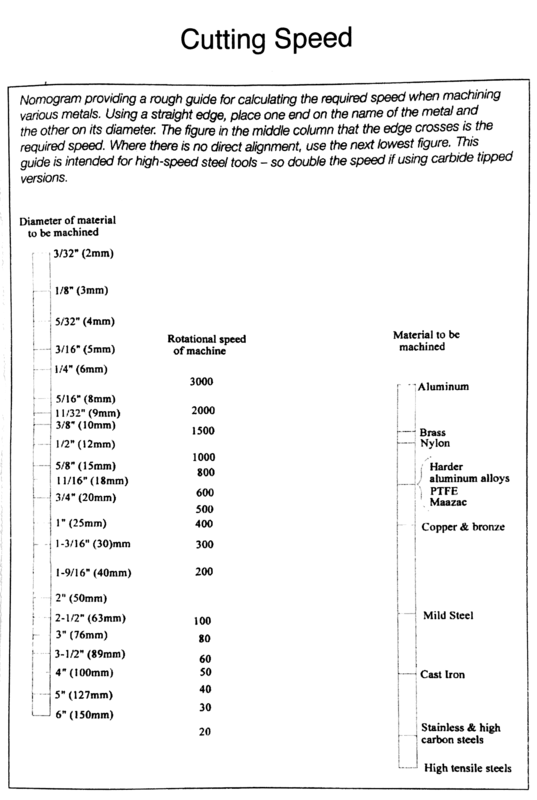 The original cutting speed nomogram came from Ian at the BCSME.